Nourish with a flourish. Skin feeling tired and in need of hydration? Want a burst of freshness and energy for skin? 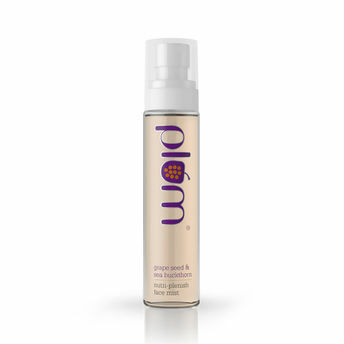 This beautifully fragranced Grape Seed & Sea Buckthorn Nutri-plenish Face Mist is your "nutri-plenish" companion. It helps to replenish lost nutrients to your skin instantly! Plum has carefully solubilized grape seed and sea buckthorn oils to give you the nourishment and hydration minus the oiliness. Added aloe juice helps calm sun-exposed skin. Plus floral extracts of calendula, hibiscus and edelweiss perk up your skin from within. This mist comes in a convenient, travel-friendly spray pack! And as always, this plum is 100% vegan, paraben-free, phthalate-free, and not tested on animals. Additional Information: Plum is India's foremost 100% vegan beauty brand, with a defined purpose of adding goodness to the world we live in. Inspired by global best practices in safe natural cosmetics and beauty solutions, Plum is focused on restoring and maintaining your skin, hair and body as nature made it to be. Designed in a London studio, Plum products are 100% vegan and cruelty-free. No parabens, phthalates or other doubtfuls - in any product. Besides being PETA-certified vegan & cruelty-free, Plum products are always free of parabens, phthalates, Propylene Glycol, SLS, PABA, DEA and other harmful chemicals. Marrying science and product expertise with innate love for nature, welcome to plum. Take in the goodness!